Neal started nature photography 12 years ago as a hobby while on a 5 year assignment to the UK. It started out simply with a small Pentax point and shoot after which the steady hunger for better quality images led him down the road of consumer then prosumer and eventually pro equipment. Neal has a passion for nature and a hunger for capturing quality images. He seeks out every opportunity to spend time outdoors. Having spent close on 27 years in the corporate world, he took regular breaks in local nature reserves and national parks during annual vacations and weekends. At sunrise on most weekends you will find him somewhere behind his camera seeking out a special moment. Neal has now joined CNP full time and is looking forward to working with you to take your nature photography skills to the next level. There have been a few special photographic moments for Neal that provided the impetus and drive to reach the next level. The first was on a short break in the Kruger where, on a night drive out of Skukuza, a leopard presented itself mere meters away with a huge monitor lizard hanging from its jaws. He was struggling to focus on the animal in the fading light with the 75-300mm Canon kit lens and 20D body. The struggle was probably more attributable to the operator’s inexperience than to the equipment but he knew he needed to change a few things. The next day he found himself at Sunset dam and shot a sequence of an African Fish Eagle taking a small Barbel from the green algae-covered surface. Very pleased with himself at the sighting and the capturing of the image, he posted it online, but it was subsequently severely criticised for its quality. It just wasn’t good enough and that was the incentive required to push him to the next level in respect of ambition and the equipment to match. As he is based in the Western Cape, the big 5 are not as accessible as they are in the North of the country. Thus his focus turned to birds and specifically the challenge of birds in flight, both large and small. Neal is an accomplished bird photographer and continually challenges himself and his equipment in the quest to capture better images of our feathered friends in flight. 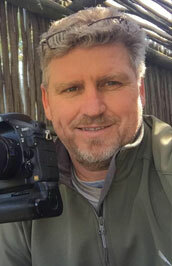 Neal has a passion for the Kgalagadi Transfrontier Park, which he has visited many times in the last 5 years as it presents many predators in mammalian and avian form. The arid landscape and dramatic colors presented during late afternoon thunderstorms offset by the red Kalahari sand dunes are dramatically unique to the area. In the absence of the cats, he seeks out the smaller animals and birds for special moments. Neal has had a number of images published in national and local magazines including a London based daily newspaper. He has also received acknowledgement through the National Parks forums by winning best images in the bird and mammal categories in a number of monthly competitions. He recently won a monthly Nature Photography competition with an image of a Spotted Eagle Owl in flight.